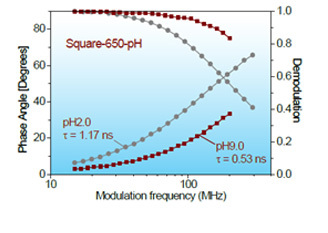 Probes such as Square-660-Carboxy show large changes in FLT upon binding to either proteins or cell-surfaces. Square-660-Carboxy is water-soluble but with a strong affinity for hydrophobic regions of biomolecules. 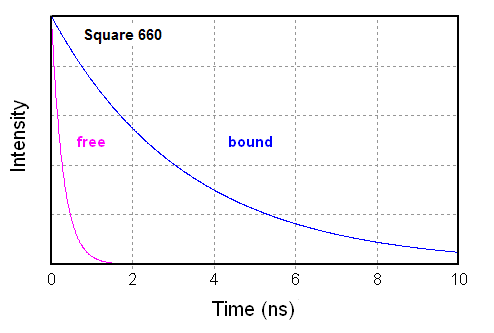 Its lifetime increases from 0.27 ns (free in solution) up to 3.56 ns in presence of 6 mg/mL BSA and 3.32 ns when covalently bound to BSA. Square-660-Carboxy before and after binding to BSA. 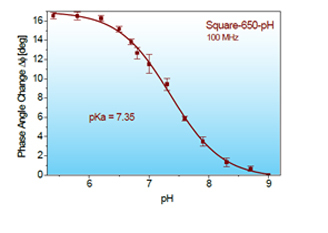 Square-650-pH-Carboxy is a NIR probe that exhibits a pKa around 7 and is therefore useful for measurement of pH changes in the physiologically relevant pH range from pH 6.5 to pH 8. Importantly both forms (protonated as well as unprotonated) are fluorescent and they exhibit different lifetimes which makes this compound also useful for lifetime-based applications (see Figure below). For more information about these dyes we refer you to the specs sheet of Square-650-pH-Carboxy and the published literature. 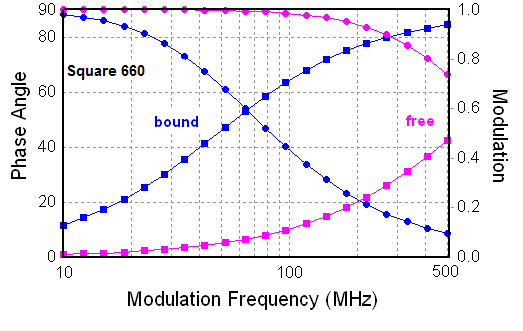 For more information about lifetime probes we refer you to lifetime applications.